The miracle of spring. Spring, more than any other season, provides the opportunity for serendipity to happen to those who are open to it. Newly emerging plants change by the hour, literally growing before our eyes. 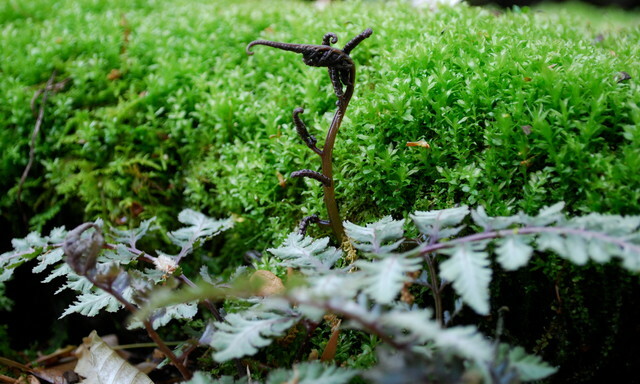 I spotted this unfurling painted fern frond at the edge of my koi pond. It stopped me in my tracks, sending me down to my hands and knees for a closer look. The frond resembled, to my eye, a happy dragon emerging from a sea of color and texture. It was gone in several hours, but until then, it was exquisite. Weeping Norway spruce and maples at Innisfree.